Water bottle eyelets are a bit of an obsession of mine. For instance, I needed to haul up to 10 litres riding across the Sonoran desert on the Arizona Trail, and in Mexican Sierra Madre, most of the camp spots in the mountains were bone dry. In my Surly Troll review a couple of posts back, I mentioned a couple of wish-list modifications, the icing on the cake to hone this burly and versatile mountain bike into my ideal dirt road, long distance tourer. 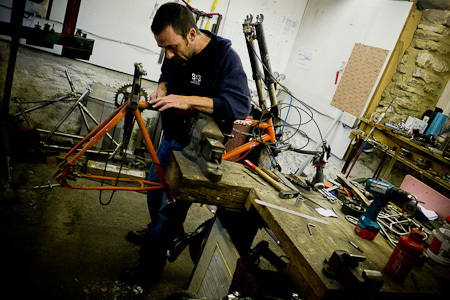 But seeing as my frame was sent to me by Surly for testing purposes, I couldn’t exactly go and fire up the welding torch (or rather, call apon the services of friend and expert framebuilder Robin Mather). So, I ended up cheekily emailing them to see if I might make a couple of tweaks to their property. There wasn’t much to do. I only really wanted eyelets below the downtube to carry an extra water bottle. 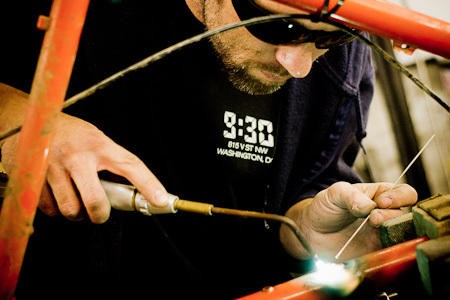 Most dedicated touring frames feature these – like Surly´s LHT – and it’s something I find really useful. Even if temperatures don’t demand that level of fluid guzzling during the day, it’s useful to fill up when I’m close to finding a camping spot. At the moment I’m running a framebag, so bottles within the frame itself aren’t an issue. 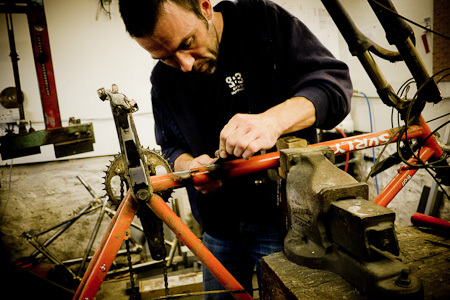 But seeing as I was in the workshop, I also asked Robin to add a third eyelet on the top of the downtube. This will give me more water cage placement possibilities for the likes of a Topeak Modula Cage XL, or the option of running one of Salsa’s versatile Anything Cages at some point. If I’d had the rigid fork to hand, I might have gone completely eyelet-happy and had some added there too, a la Salsa Fargo and Surly Ogre. But I’m running suspension at the moment, so that useful mod will have to wait for another day. 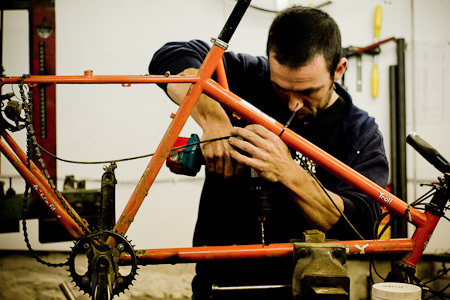 Making these changes will inevitably void your frame’s warranty. Although they’re straightforward enough to carry out, make sure you have them administered by someone who knows what they’re doing. Think hard about the placement of this extra bottle. 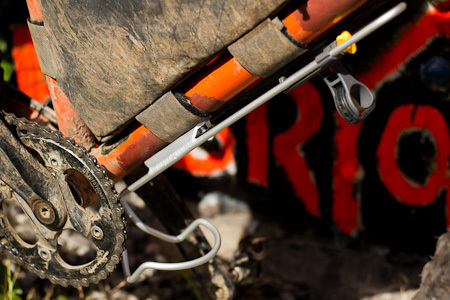 Position it low for stability, but make the cage sits above the chainrings to reduce the chance of it getting snagged when tackling rocky terrain. Allow extra space if you intend to run one a larter Topeak, BBB or Minoura’s cage, which extend lower than normal. If you are, make sure the top of a 1.5 litre bottle has plenty of clearance with a rigid fork (and potential mudguards), as well as with suspension that’s under compression. Lastly, I should add that there are ways of getting round this issue without resorting to surgery by using zip ties, something like this or bottle cages designed for frames without eyelets. Hose clamps are a good option too. Butas well as being more elegant, this is certainly a more secure solution, and makes an easy, useful addition to a frame that’s due for a respray. Framebag and wheels removed, Robin marks the spot where the torture will begin. I look on nervously. A steadier hand than mine… This third hole will be ideal for carrying 1.5 litre water bottles, or Salsa’s Anything Cage. … in preparation for the Rivnut eyelets that will be screwed into place. 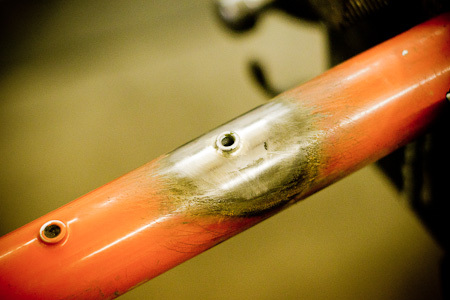 The tube is warmed, and some brazed dribbled around the nuts to stop them from spinning. Job done, I pitched the ‘mid on Robin’s lusciously soft garden lawn that night, and the bike was ready to ride home the next morning. I’ve been really enjoying the massive floor space and height in this tarp; it weighs just over a kilo, yet sleeps two in luxury and four at a squeeze. Despite its flaws, I’m tempted to take it back with me to South America – my abilities to sew in a flap of mosquito netting round the base will be the deciding factor. On my way back, I swung by Cadence Bikes in Bath, who had a Topeak Modula XL bike cage in stock. Perfect fit. I can now carry an extra 1.5 litres of water and drink to my heart’s content. This entry was posted in Bike Talk and tagged Robin Mather, Surly Troll on August 17, 2011 by Cass Gilbert. Thanks for that Andrew, the Golite looks cool. Oookworks don’t currently do a conversion for the Black Diamond, but I’ll ask them about it. There is, in fact, a Black Diamond inner that’s available, but it’s heavy and expensive, and reduces internal space a lot. My plan was more to fit a strip of mozzie net all around the base of the tarp, which would rest on the ground. Dan, who I rode with in Alaska (we used his tarp for that part of the trip) had done that. It worked pretty well, without too much extra weight and pack space. 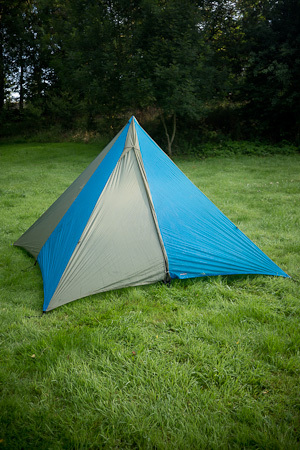 I might well end up taking my Tarptent back out though, as it has a built in mosquito liner. It’s roomy, just not as much as the BD. I was thinking about a velcro fitting, so it could be removed if needed. .
I’ve got the Shangri-La 3 with their full mesh inner. Loads of room but no porch. Not too keen on using it without the inner as I smell nice to insects & come up in big lumps when they bite me. I’ve been thinking about one of the Oookworks 1/2 nests. Nice idea with the mesh skirt, like snow valances , would something like those Sierra Design Grip Clips hold it in place ? Hose clamps, rather than zip ties, take care of extra cages. The problem is that you are limited to cages with “tabs”, to gain some purchase when clamping. For standard bottle mounts, the Profile Design Kage holds a 40oz. (1.2L) Kleen Kanteen, or similarly sized bottles. I recently spotted a 1.5L Sigg bottle that was approximately the same width as the Kanteen. I have heated water in stainless bottles, and have stored juice, milk, beer, and gin, without leaving any residual “flavor”. Thanks for those nuggets Nick. I’ve tried those Profile Kages before and like them, though I didn’t realise they fit such a big Kleen Kanteen. That’s good to know. I think the Siggs are aluminium? When I fitted a Topeak Modula to my last frame, I couldn’t get hose clamps to work round the tabs so ended up with an ugly hotpotch of zip ties and velcro strips. Hose clamps worked fine on attaching water bottle cages to a suspension fork, but they did work loose and pop off the tab every once in a while. Nice mods. As you noted, I did similar on my Karate Monkey http://sweetbike.org/2011/08/11/surly-bad-monkey here, putting the 3rd cage under the downtube. I’m working on a second iteration of the Bad Monkey called the Combat Monkey. It’s on a 20in frame instead of an 18in frame, brazeons are in a slightly smarter location, and it will have internal dynamo hub wiring. I put 3 brazeons under the downtube for water bottle positioning flexibility. Later I had the idea that I might be able to use the Salsa carrier thing. Turns out no. 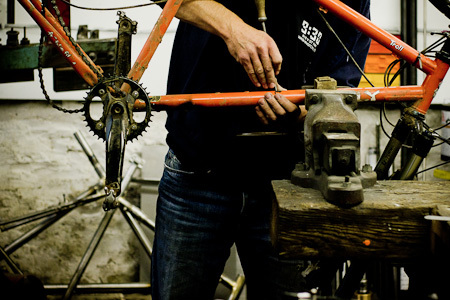 They spaced the 3 braze-ons out a little wonky, preventing that from working – Fargo forks only it would appear. I stand corrected – apparently they fixed these cages so it will work now. I have – and yeah, it’s going on the Combat Monkey. Speaking of – check it out. 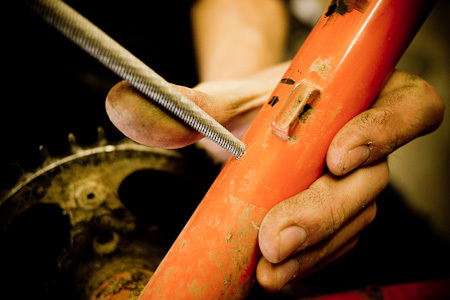 Modding it for dynamo hub wiring. nice. look forward to seeing the finished thing.